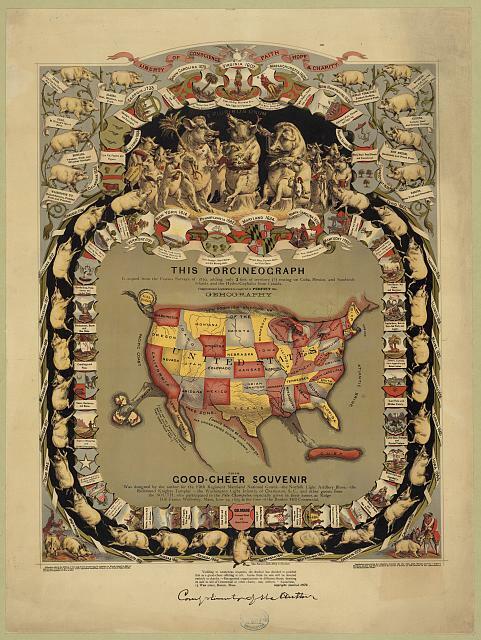 This website’s header image is taken from “This Porcineograph,” an 1876 lithograph depicting a map of the United States in the shape of a pig. Research by Rebecca Onion, over at the Slate Vault blog, reveals that the map was commissioned by William Emerson Baker, a man who made his fortune selling sewing machines. After his retirement, in 1868, Baker became involved in the Pure Foods Movement. As Onion reports, the Porcineograph was intended as a party favor for guests attending the launch of Baker’s “Sanitary Piggery” farm. But the image also endures as an example– one of my favorites!– of one of the major forms of information visualization that dominated the nineteenth century. (Here, for instance, is Elkanah Tisdale’s 1812 political cartoon of the Gerry-mander). If you’re interested in this history of visualization practices, you can view some of my work on the subject here. Image credit: Library of Congress. Complete information here.